TOKYO -- An overnight bus on its way to a ski resort in central Japan careened off a mountain road early Friday, killing 14 passengers and injuring 27 others. Fire and disaster management officials said the bus veered into the opposite lane near the famous resort town of Karuizawa, in Nagano prefecture, rammed through a guardrail and slid down the mountainside a short distance. TV footage showed the bus resting on its side against some trees, bent in the middle. 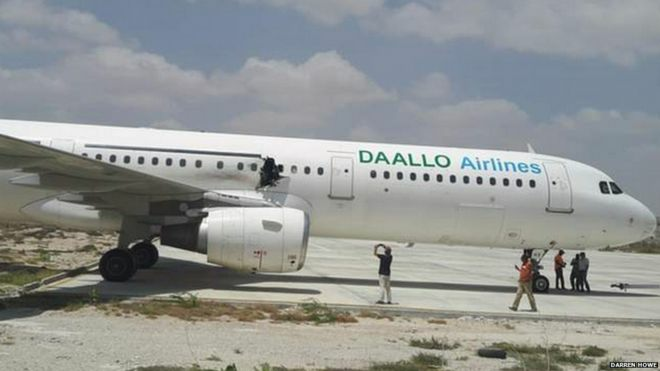 A passenger plane has made an emergency landing in Somalia's capital with a gaping hole in its fuselage. ... "It was not an explosion but a fuselage failure at 10,000ft,"
The crew operating a crane in Lower Manhattan on Friday morning took note of the wind gusts accompanying the falling snow. The workers, officials said, decided they needed to lower the crane to a secure level, and so around 8 a.m., began to bring down its boom, which stretched 565 feet toward the sky. 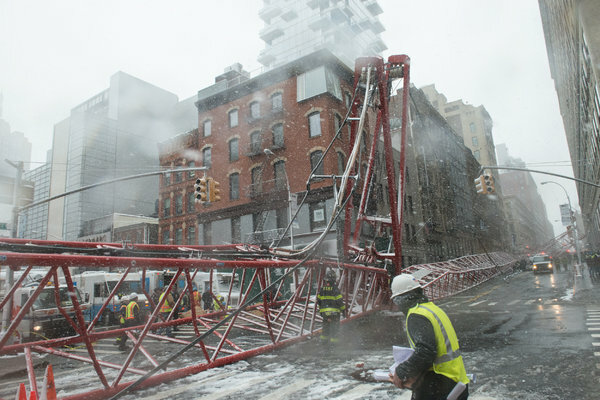 But instead of a steady, controlled descent, the crane began to topple over suddenly before plunging into a free fall and crashing to the ground on Worth Street in TriBeCa. After the flight safely taxied to the terminal, 8 people complaining of respiratory irritation requested to be examined, according to the LAFD. One of these 8 was a flight attendant. A passenger of the flight, Ekaterina Sokolova, described the details of the emergency landing, NTV reports. According to the passenger, one of the engines of the airplane exploded shortly after takeoff. The people on board started panicking, some were screaming, others were crying and praying. The pilot requested emergency landing soon after takeoff. Oxygen masks were released, the plane landed safely, and all passengers were evacuated via inflatable ladders. Witnesses at the Arizona Memorial visitors center described seeing smoke coming from the helicopter's tail shortly before it went down in the water just off shore. Good Samaritans who saw the crash said they jumped into the water and helped pull the people to shore. A knife was needed to free one of the passengers from a seatbelt in the chopper. Max Burner, of Redwood City, Calif., said the helicopter started "sputtering" at about 500 feet before crashing just off shore. . . . . maybe all U.S. flights are getting less fun these days! AP - RIPLEY, N.Y. — Authorities say a freight train carrying hazardous liquids derailed in far northwestern New York and forced the evacuation of several homes. Gov. Andrew Cuomo says the train was traveling on the Norfolk Southern line near the town of Ripley when about 15 cars derailed around 11:30 p.m. EST Tuesday. The landing comes less than a week after a Cirrus SR22 lost engine power near Republic Airport in Farmingdale. MOSCOW — A passenger jet flying from Dubai crashed in southern Russia early Saturday, killing all 62 people aboard, Russian officials said. The Boeing 737-800, operated by FlyDubai, crashed during a repeated landing attempt in the city of Rostov-on-Don in “poor weather conditions,” Russia’s Emergency Ministry announced in a statement. In a second approach in heavy winds, the plane’s wing “hit the runway, began to break up, and burst into flames,” the statement read. Did the wing hit the runway or did the wing (presumably with fuel tanks inside) fall off the plane and hit the runway? ...the helicopter appeared to have come down the side of a mountain and crashed at the foot of it. “There’s a little bit of the tail fin of the helicopter, and that’s about all that’s left, that and the console, that’s about it,” he [ police chief] said. An Air Berlin Airbus A320-200, registration D-ABNT performing flight AB-2191 from Las Palmas,CI (Spain) to Leipzig (Germany) with 179 people on board, was enroute at FL340 about 80nm south of Nantes (France) when the first officer became incapacitated after fumes had been noticed on the flight deck prompting both flight crew to don their oxygen masks. The captain diverted the aircraft to Nantes for a safe landing on runway 03 about 15 minutes later. The first officer was taken to a hospital. KUT, Iraq — An Iraqi Mi-35 helicopter crashed south of Baghdad due to a "technical problem" Monday, security officials said, the latest in a series of military helicopters to go down. CANBERRA, Australia (AP) — Authorities in Australia were tight-lipped Thursday about the circumstances surrounding the death of an experienced Qantas Airways Boeing 747 pilot, who crashed a small plane off the country’s coast this week. Paul Whyte, a first officer on the Australian airline’s international flights, was the only person aboard a rented Cessna 172 when it vanished from radar late Monday over the Pacific Ocean 11 kilometers (seven miles) northeast of Byron Bay, near Australia’s most easterly point, Northern Rivers Aero Club president Wally Soward said. Dr. Leuren Moret says, "WOW - the Wigner effects are starting to REALLY show on the number of pilots that are now in shortage." There are many airline mishaps and 'driving errors' on the runway this week. We won't post them all because there are too many. But these 2 small incident are typical of what's going on everyday in the US and other places. They may not make national news, but there are a LOT of them. Hundreds of people are awaiting a new flight at Hartsfield-Jackson International Airport after their plane had to make an emergency landing for a cracked windshield. The American Airlines flight landed around 3:30 p.m. It originated in Miami and was going to Chicago. EL PASO, Texas -- One teenage girl was killed and another was injured when they were ejected from a whirling ride at an El Paso church carnival. In that Norway chopper crash ... the blades fell off the chopper! Dr. Leuren Moret says, "Wigner is the only think that could have caused this - and they are far to the north where the Fuku rad is being pumped through the Arctic Ocean into the N.Atlantic." ...The Beech BE35 aircraft crashed on Cold Spring Road around 3:39 p.m. Tuesday, shortly after the pilot put out a mayday call in which he sounded calm but expressed concern as the plane "lost more" of its panel. Three people onboard were killed and have yet to be identified. Those with a window seat got quite the view: The piece covering the plane's right engine -- or cowling, as it's called -- had come off. As photos posted by CNN affiliate WTVF showed, the loose piece then appeared to have struck part of the fuselage. The pilot declared an emergency, and the plane landed safely in Nashville. The federal government’s top offshore drilling regulator warned Tuesday that metal bolts used to hold together drilling equipment under the surface of the ocean were failing faster than anticipated. Brian Salerno, director of the Bureau of Safety and Environmental Enforcement, said so far the failures had not resulted in any major oil leaks or other incidents but the rapid corrosion concerned inspectors. TOP U.S. MILITARY STUNT PILOTS CANNOT KEEP THEIR CRAFT ALOFT! ENDANGER PRESIDENT! The fighter jet had just flown over the USAF academy's graduation ceremony in Colorado Springs, where President Obama delivered the commencement address Thursday. News 2 spoke with witness Paula Payne who said the jet sounded louder than normal shorty before the crash. “I looked out the window and heard the planes maneuvering again. I looked out the window and saw one straight out here come down, hit the ground, and explode,” she said. Becca Burgess said she had been hearing the jets all day and noticed one was flying particularly low. Russia says one of its Sukhoi Su-27 fighter jet has crashed in the Moscow region, killing the pilot. The Defense Ministry said on June 9 that the aircraft belonging to the Russian Air Force's aerobatic demonstration team -- the Russian Knights -- was returning to its base when it crashed. The ministry added that the plane did not carry any ammunition and the crash did not cause any serious damage on the ground. The Defense Ministry's investigative commission is working at the site to try to determine what happened. "The pilot told passengers seconds from landing that there was a problem with landing gear on the plane, which had flown from Trivandrum International Airport in India. 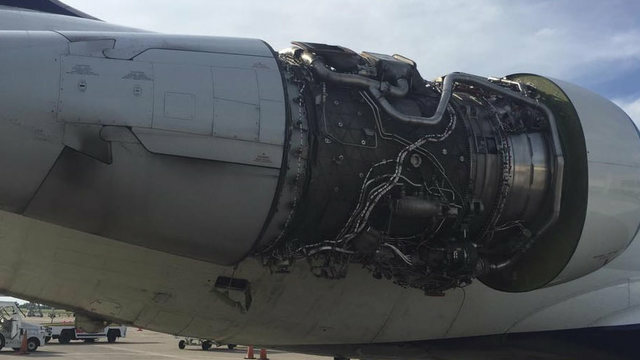 Other reports claimed the engine on the right side caught fire and fell off while coming in to land." ... For being part of a $1.12 trillion project, the US military’s costliest weapons program ever, the stealthy Lockheed Martin F-35A Lightning II might be expected to be presented as one tough cookie. But this cookie is crumbling, specifically from the inside, where poorly built insulation material is “crumbling” into fuel tanks, according to a statement from the US Air Force, Reuters reported. Problems with material breaking off into fuel tank cooling lines “was discovered during depot modification of an F-35A and affects a total of 57 aircraft,” Air Force spokeswoman Ann Stefanek said Friday. A vice governor of Okinawa Prefecture in southwestern Japan has lodged a protest with the US military over a crash by a Marine Corps aircraft at sea. Mitsuo Ageda visited Camp Zukeran on Friday to deliver the protest, a day after a Harrier aircraft went down in the Pacific Ocean off Okinawa's main island. Wigner: Airplane Blows Up Ft Lauderdale Florida Airport Faulty Landing Gear or Galaxy Note 7?